The video game-violence link isn't worth debating. It should be about free speech. 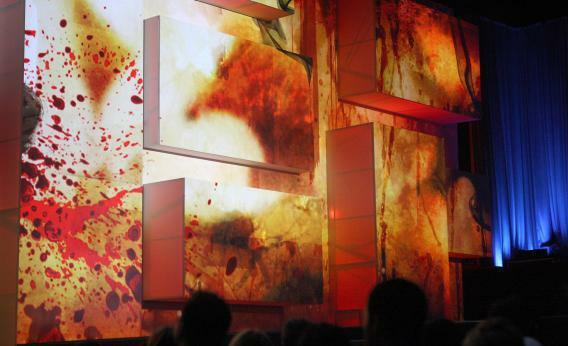 Blood spatters are projected onstage as Sony Computer Entertainment America President and CEO Jack Tretton introduces a violent game at a press conference. Coverage of Aaron Alexis’* murders has given some a new opportunity to express their concern about the possible link between violence in video games and in real life. One person who knew the shooter said that “[i]f he had anything bad about him, it was that he was a 35-year-old man playing video games.” Indeed, reports say that Congress is “likely” to hold hearings about violent video games in the near future. Some gamers, of course, are responding by saying there’s no link. They also point to the lack of proof of causation after the Sandy Hook shootings were blamed in part on Call of Duty. But focusing on whether there is or is not a connection between video games and violence suggests that gaming advocates need this argument. That subsumes the greater argument of the debate: The First Amendment protects video games. Worse, focusing on whether there is a link pins the rest of us to the current and future absence of evidence of causation. This myopic focus on evidence didn’t start recently. During the 2005 debate over possible legislation that would have imposed fines on those who sold Mature or Adult-Only video games to minors, we saw the funding and production of some research that supported claims linking violent media to real-world violence. It’s something that at least a few gaming advocates refuse to acknowledge. Exposing flaws in methodology is good; claiming there has never been a showing that links violence to games (and suggesting there never will be), not so much. That 2005 bill, sponsored by then-Sen. Hillary Clinton and Sen. Joe Lieberman (among others), never passed. But that was an easier time to navigate the political environment, largely because it was defined primarily by the Grand Theft Auto coffee mod and Jack Thompson, rather than the current this-must-be-the-apocalypse mass murdering of children. And games, as they increasingly prove themselves as art, are also pushing other boundaries. This fight for free speech is getting harder, not easier. But by the time claims of no evidence become hollow, free speech advocates will be distrusted by the broader public. It will always be a weak spot where censorious bastards can attack violent video games. Then it will require Herculean efforts to change the debate’s focus back to the trump card advocates should have been using all along: the First Amendment. In other words: Gaming advocates have taken the bait. By drawing us into a dialogue where the primary question is “Does violent media make people more violent?” content control advocates have backed free media advocates into a corner. Does violent media make people violent? Most research says no, or at least not clearly in any long-term capacity. But is it impossible that violent media somehow, someway makes people more violent? Or may be linked in some other way? Can we simply dismiss slight increases in aggression? Does all research say no? Does every reasonable person think not? Are you personally, fundamentally certain that it never does? The honest answer to all of these is also, unfortunately, no. By over-relying on the evidence argument, we become desperate to argue against any evidence that disagrees with us. Meanwhile, reasonable people will be swayed by experts, congressional reports, and new studies that no one can anticipate. Dismissing evidence that reasonable people take seriously is a great way to get yourself dismissed. We need additional perspective, both for a more honest, robust debate, but also because the stand for free speech—and freedom to hear, see and interact with that speech—should never have taken a backseat to the evidence argument. It empowers censors by hiding that they are censors. It is the step that changes the argument from one about freedom of speech to one about freedom from evidence. Correction, Sept. 21, 2013: This blog post originally referred to Aaron Alexis and Alexis Aaron. Also, due to a photo provider error, the photograph caption misspelled Sony Computer Entertainment America CEO and President Jack Tretton’s last name.